The past week has been characterized by feverish diplomacy regarding the Arab-Israel conflict. The sheer scope of the meetings that have taken place – from the shuttle diplomacy of Secretary of State Condoleezza Rice and UN Secretary General Ban Ki-moon, to the conference of Arab League foreign ministers in Egypt last weekend to the summit of Arab leaders in Saudi Arabia on Wednesday – one would think that peace is just a stone’s throw away. All the various meetings have centered on the so-called Arab Peace Plan, or as it is more commonly known, the Saudi initiative. Earlier this month Israeli Prime Minister Ehud Olmert announced, “The Saudi initiative must be taken seriously,” and then claimed that it had “positive aspects.” Israeli Foreign Minister Tzipi Livni also warmly praised the plan. Rice has led the Bush administration in embracing the plan and applauding the Saudis for their “moderation” and their positive role in advancing the cause of peace in the region. In talks with Egyptian Foreign Minister Ahmed Ghreit on Sunday, Rice went so far as to intimate that the U.S. now views the plan as the basis for peace making between Israel and the Palestinians. But frenetic discussions aside, there is no chance whatsoever that the Saudi initiative will bring peace to the region or end the Arab world’s conflict with Israel. The Saudi initiative was concocted in February 2002 as a public relations stunt on the part of then-crown prince and now King Abdullah of Saudi Arabia. At the time, Saudi-U.S. relations were at an all-time low. Fifteen of the 19 hijackers on September 11, 2001 were Saudi citizens and in the months following that act of war against America, the media exposed Saudi Arabia’s massive role in financing the global jihad through direct aid to terror groups and the establishment of jihadist mosques and schools from Pakistan to Peoria to Paris. Attempting to reassert their importance as an ally to Washington, the Saudi government wanted badly to change the subject. What better way to divert attention from their central role in the global jihad, whose forces openly called for the destruction of the U.S. and of the Western world, than by taking on the role of peacemaker in the Middle East between Israel and the Palestinians? Here too, it is important to remember the context of events. In February 2002, the Saudi-financed Palestinian jihad against Israel was reaching a fever pitch. Suicide bombings had become a daily occurrence. Indeed, in March 2002, some 130 Israeli citizens were murdered in terror attacks that culminated with the Passover massacre at the Park Hotel in Netanya where 30 Israelis celebrating the seder were murdered by a suicide bomber. It was at this time that Abdullah (breaking his monarchy’s law that bars Jews from entering the kingdom) invited New York Times columnist Thomas Friedman for a visit to Riyadh. During their meeting, Abdullah suggested that were Israel to return all the land it took control over in the 1967 Six-Day War, including Jerusalem, the Golan Heights, Judea, Samaria and Gaza, the Arab world would consider normalizing its relations with Israel. The next month, the Arab League convened in Beirut. The meeting took place the day after the Passover massacre (and on the same day that a conference of international terror chiefs was convening in the city). At the summit, the Arab heads of state made a number of changes to Abdullah’s offer to Friedman and then adopted it as the Arab peace plan. 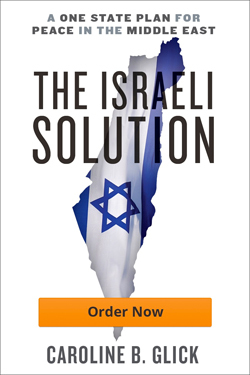 The plan that was announced at the time – and it has not changed in the intervening five years – involves more than Israel’s surrender of all the lands it liberated in 1967. The plan also demands that Israel accept some 4-5 million foreign-born Arabs, (otherwise known as Palestinian “refugees”) as immigrants. The Arab League’s plan stipulates that after Israel completes the withdrawals and enables these foreign, overwhelmingly hostile Arabs to immigrate, the Arab world will agree to have “regular” relations with it. Five years ago, Israel rejected the plan completely, and reasonably so. Far from a “peace plan,” it is a recipe for Israel’s destruction. Without the lands that the plan requires Israel to surrender to the Palestinians and the Syrians, Israel is incapable of defending itself from invasion. The Arab peace plan, in other words, requires that Israel render itself indefensible. Moreover, the demand that Israel allow the unimpeded immigration of millions of hostile Arabs is simply another way of saying that Israel must agree to allow itself to be overrun and so demographically destroyed. Finally, the plan’s statement that in response to these suicidal steps by Israel the Arab world will agree to have “regular” relations with it is itself meaningless because the term “regular” is an empty one. All in all, the Arab “peace” plan is nothing but a blueprint for Israel’s destruction. Given its content, it should surprise no one that the plan makes no mention of terrorism and places no demand on the Palestinians to end their terror war against Israel or on the Arab world to end its financial and other support for the Palestinian war. Then too, the plan makes no mention of holding negotiations with Israel; of ending the Arab economic boycott of Israel; or of ending the jihadist incitement that has indoctrinated the current generation of Palestinians and Muslims worldwide to seek Israel’s violent destruction. And the “peace” plan makes no mention of the possibility that the Arab world would recognize the Jewish people’s right to a state in the Land of Israel and thereupon open diplomatic relations with the Jewish state. The sanity of Rice and Olmert and Livni is not the issue. Rather, it is their strategic wisdom that seems to be sorely lacking. Perhaps they believe that if they are perceived as advancing the prospects of peace by clinging to the Arab plan for Israel’s destruction they will receive a needed, if momentary, boost in their popularity ratings. If that’s what’s moving them to act, it is a shame. Not only is the plan doomed to fail, it will cause the deaths of untold numbers of Israelis who will be killed because neither Rice nor Olmert nor Livni is honest enough to admit that Saudi Arabia is neither a moderate nor a peaceful nation.